So yesterday I became so caught up in various small tasks that FaM fell into a dark pit. Oh well. Over the weekend, some Friends Who Bead met at WonderAccountant’s house. My project was to rebuild a necklace I’d made incorrectly. Then, with nothing much left to do, I laid out some beads for a small bracelet and got advice on how to make a turquoise necklace look better: lose the cheesey fake-Native American decorative bead. With all that left out on the coffee table, come y’day it was time to put it together or put it away. That took half the afternoon. In the process, I reflected on how cluttered my “jewelry” box is. It’s actually a crafts box with a jillion little compartments. When I got the thing, it served well for my vast collection of DIY valuables. Over time, though, the priceless gem collection has grown so that it’s hard to find what I want in the jumble. This box is kept in the office closet, which is behind a solid-core door with a bust-your-drill deadbolt on it — because the only thing of any real value in the house is my computer. They can steal everything else, but leave the damn Mac alone. 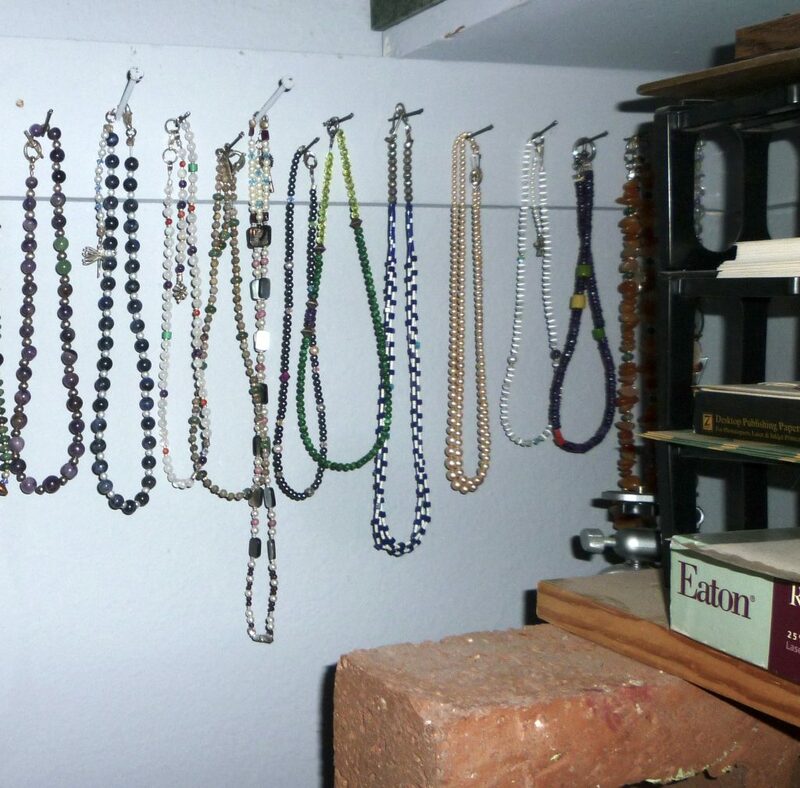 We’re told that when burglars break in these days, what they’re looking for mostly is jewelry. A friend of mine had a lifetime collection stolen — all pieces with sentimental value, many of them picked up on her travels with good friends. In my case, though, they can take the stuff and good luck to them trying to peddle it to a fence or a pawnbroker. It’s all straight from Michael’s, Bead World, or Fire Mountain. 😀 But…it cost some work to make it and I’d just as soon not have it stolen. Plus the office storage is a convenient place to keep the junk. Contemplating the clutter, it occurred to me that instead of buying another craft box — providing two boxes to have to paw through instead of just one — there was a simpler, cheaper alternative: Hang the necklaces on nails in the closet shelf braces, leaving plenty of room for earrings and bracelets in the box’s compartments. So I tapped a bunch of tacks in there…and lo! It worked. And I can see the things at a glance. Best of all, it’s FREE! That’s kind of amazing. What possessed it to blossom in October, I do not know. Probably the unseasonable heat: even though the nights are longer & the days shorter, temps are in the 90s and predicted to go into the low 100s this week. So I guess the plant thinks sumer is y-cumen in. Oh well. Gerardo finally showed up — I suspect because I complained to La Maya, who regards him as a friend. And he is a friend…just a busy one. He and his underlings are out there now, banging and blowering around. He was surprised to see the new panel in the watering system. Not as surprised as I was to see the $300 bill to get it fixed…but what, really, did he think I was going to do? Just let everything die, or drag hoses from plant to plant, every day, on a quarter acre of trees and landscaping? Oh well. I asked him to repair the quarter-minus, which has been trashed since we repaired Richard’s ill-advised river of rock. Whether he’ll do it or not remains to be seen: he has a lot of other yards to cope with these days, and I’m sure he’ll be wanting to get to them as early in the day as possible. The pool is blossoming, too: algae. The chlorine level is so high it turns the test tube deep orange, so apparently that is not the issue. Exactly what I’m supposed to do about that escapes me. Probably today I should schlep a bottle of the water up to Leslie’s and listen to the guy tell me what he always tells me: take out the chlorine tabs (done: a week or ten days ago) and wait until it goes down. But…it ain’t workin’. I’d like not to have to drain & refill the pool this winter, partly because it’s still too hot to do so — heat damages the plaster — and partly because I’ve had one big financial hit after another and just want the pricey little jobs to STOP for awhile. Moving on, today I’ve got to deposit 87 berjillion small checks gathered by Funny about Money. It might be more time-efficient just to make the 40-minute round trip to the credit union. Then continue on to the Costco — I could do with a couple bottles of wine, I guess. But…the Walmart grocery store has the same type of mid-range wines, and it does not present itself as a vast bazaar of impulse buys. I really do need to keep the spending down for the rest of this month! One of our clients, a journal, changed editors. We stayed to review copy, which is good. The editor just sent page proofs. We don’t usually read the journal’s page proofs…but there they are. I’m finding things that I know we changed, which have been stetted and which will make the thing look kind of stupid. But I guess you can take a horse to water… Seeing a lot of changes that needed to be made have been ignored (these are not whims, but grammatical and stylistic issues), I am not inclined to read this stuff character by character and word by tedious word again. Especially since it’s not part of our job: we’re not proofreaders; we’re copyeditors. I am, I think, going to ask to have our business name removed from the masthead. We will look like idiots if this thing goes to press with every third edit overridden by someone who doesn’t know how publishing works. Onward: Gerardo out, coffee made, breakfast under way. 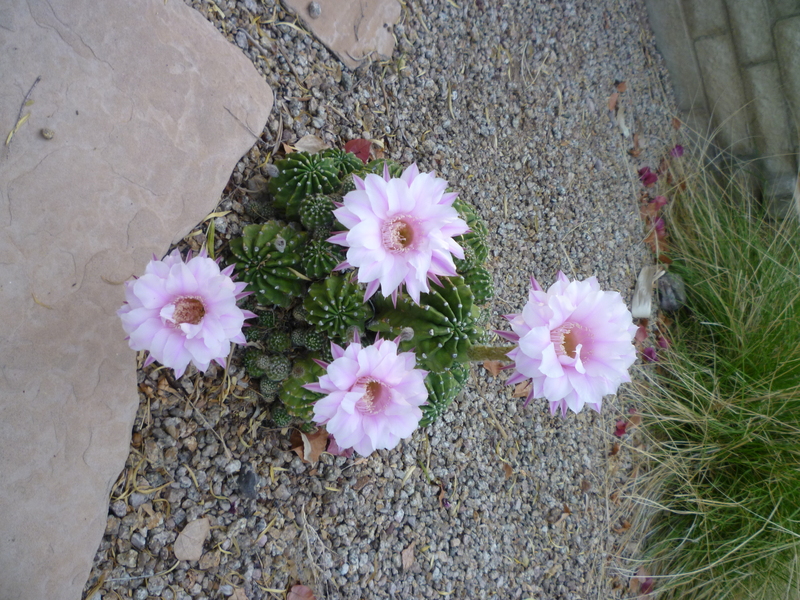 I have five Christmas cacti, one of which, for the last few years, has started blooming just before Halloween. 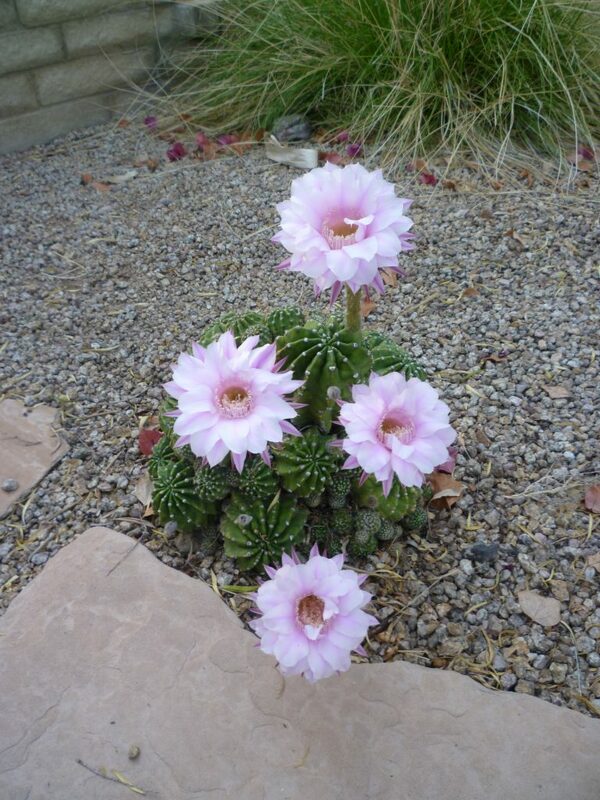 Thus – it has become my heathen cactus.